I have been having my first go with Symbaloo today, by putting in my most used bookmarks. I can see loads of potential, with embedding visual website lists / grids onto my class sites instead of just lists of links. It seems like you can make lots of different collections and name them and embed them separately. It really appeals to my need to have visual content and not just lots of words!! 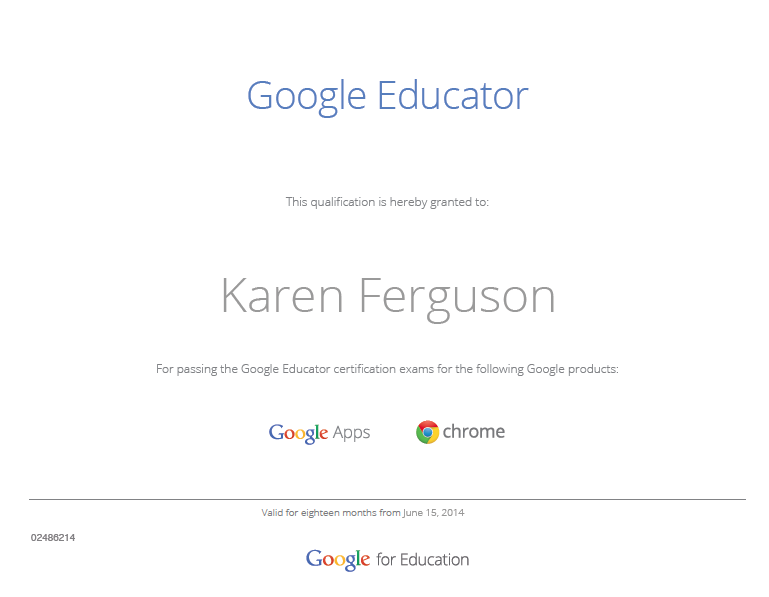 I passed my last Google Educator exam today. I have been taking the 5 exams over the last month and a bit and I took the last one, the option choice, today. You have to take 4 standard exams, sites, calendar, gmail and docs / drive and then you get to choose from a selection for the option choice. I chose the Chrome browser. 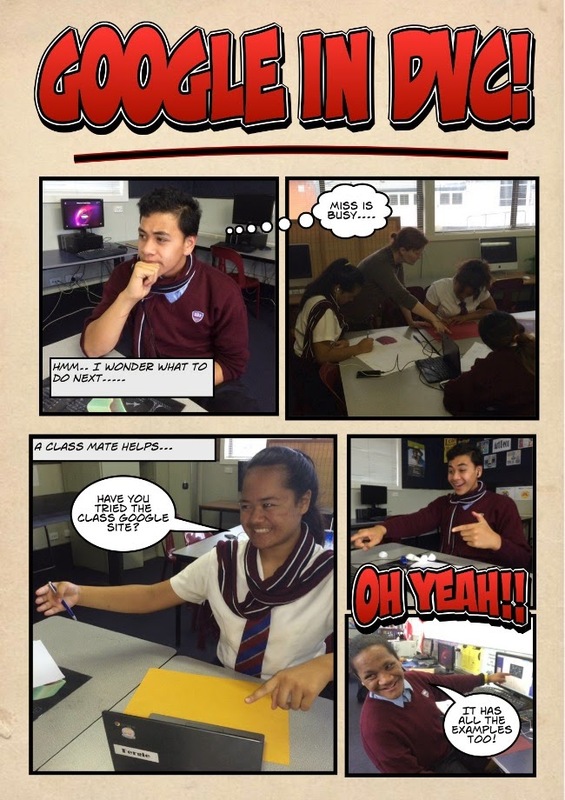 We had some fun in the Level 1 and 2 class today making a visual and audio cartoon strip about using Google sites in the class. This is part of some presentation work we are putting together for the research group, but we had a lot of fun acting it up for this one. 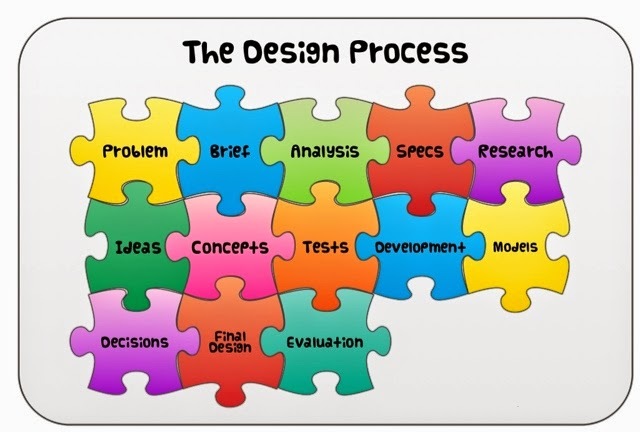 The design process is an interesting framework. It doesn't actually matter where you start in it and all the parts help support the others. You can start with evaluating the final design work of others (an existing product, for example), work out the positives and negatives and use that to formulate a problem/situation to work to. You can start with a wide range of concepts on a theme and with the feedback from clients / interested parties, write specifications that can guide the design brief. I am guilty of always working this process in a linear manner in the classroom, starting from a situation / problem and working through to the end evaluation. It might be interesting with the seniors to mix it up and start in the middle, with some product testing at the start of a project. The Level 1 mobile phone project coming up later in the year might be an ideal place to give this a go and that group has a really good "give it a go" attitude. 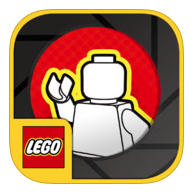 I have downloaded an app on my iPad called Lego Movie Maker and I gave it a go today in my continuing experiments in animating lego characters. Link to the app here. It was really easy to set up, just give your project a name and you were away. What I liked about it especially is the fact that it gives you an "onion skin" of the last shot you did, so you can position your next movement more accurately. Here is a really quick test that I did of the character walking, so I could get the hang of using the app. You can take shots really easily by touching anywhere on the screen and when you are finished, it can save out to the camera roll of the iPad so it is available for upload and sharing. Here is my second attempt today, with "help" from Eric and Malcolm who couldn't resist offering advice!! These are silent first experiments. The app allows you to add sound effects that are preloaded or you can record your own sounds, so this will be my next direction. As a school, we are focussing on PB4L - Positive Behaviour for Learning, and we have recently had an opportunity to go to some Functions of Behaviour workshops. I have been trying to put some of this into practice recently as I have a new Year 10 group on their Technology rotation. We are still drawing, instead of being online yet, as they seem to like drawing. 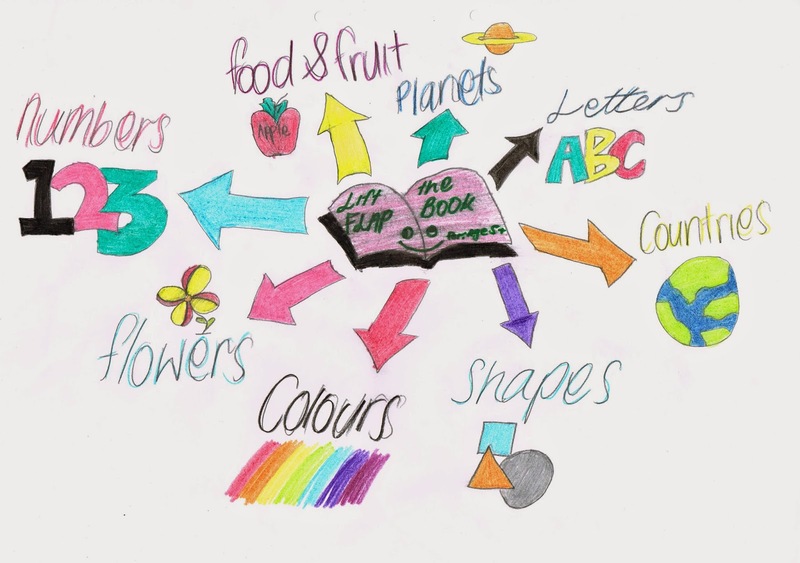 The spider diagram of ideas for a lift the flap book are being drawn instead of being done on a Google drawing, as they like drawing. We are then scanning them in as they complete them and adding them to a Google Plus album. Students who are off task are getting back on track by about half way through without me nagging them as they are seeing the rest of the class doing it. (This is about 2-3 students out of a class of 20). If I am being honest here, this is the part that I am finding the hardest to do. This ignoring the off task behaviour and not making an issue of it is difficult, but as I am finding that the feeling in the class is calm because of this, I will keep this in my head and keep going!! Students are telling their maths teacher, who they get before my lesson, that they are excited to be going to Graphics. That is good and I want this to continue. Another good reason to keep my wobbles to myself and keep moving forewords. I want Year 10 students to enjoy my subject if I want them to consider it at Level 1 next year. A calm lesson with some very nice work being produced so far. A calm and easy tidy up at the end. The students are getting their folders straight off the front table as they come in and are sitting down and getting on with it without being told anything. I am finding these lessons enjoyable, because I am not nagging at them, but really tiring as I am "ON" for the full time. When we (the class and me) get into a routine, I am sure it will be easier, but I really am not minding at the moment as I am not ending each lesson struggling and I hope it will continue that way. After going to see the Lego movie, I have been inspired to have a go at stop motion animation again. I have not had a serious play with this since I was at University, and I made a plasticine movie with an old super 8 cine camera. Then, I had to wait for the movie to come back from processing in the post for me to see what it looked like. Next, I had to feed it up onto the cine projector that I had picked up from a second hand camera shop in Sunderland. Today, this test took such a short time from making to viewing, it was great. I went shopping for some Lego yesterday and had great fun this morning making up the little set that I bought. For the test, I decided just to try and make the character walk. I set up a small digital camera up on a little tripod and I was away straight away. My first thought was to move each leg one at a time to make him walk. This proved a no go as the balance of the Lego man would not allow it ( note to self - get some blue tac!! ), so for this test I just shuffled him from side to side. The bit that proved frustrating was using iMovie 10. It was easy enough to set the project to have no "Ken Burns" on each photograph, but I could not find where to set the time for each one. I ended up doing each photo individually, which was not too bad today as there wasn't many photos in this short test, but for the future, I must find out how to do this in bulk.